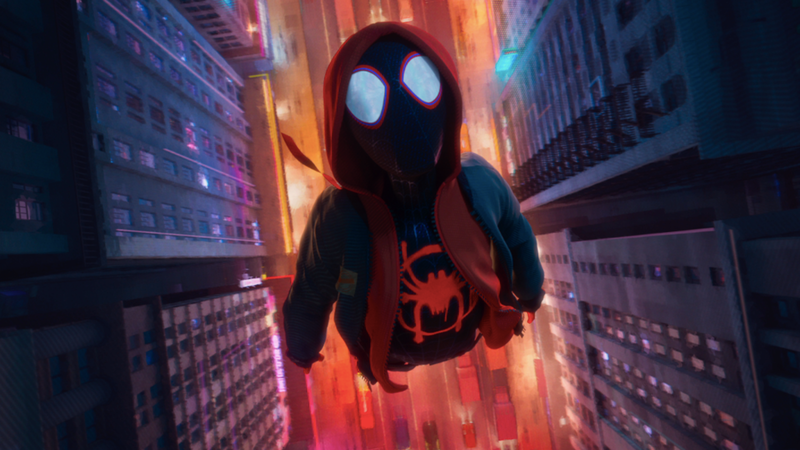 Spider-Man: Into the Spider-Verse has thwipped itself into cinemas as one of the best films of the year. Its earnest, almost brazen adoration of the simple joy of comic books oozes from every stylish frame—and if you found yourself enchanted by its comic style and cast of Spider-heroes, we’ve got some reading recommendations. Given that Into the Spider-Verse introduces not just Miles Morales, but a whole host of Spider-people alongside him, we decided to break our recommendations down by each of the new heroes—so if you’re hankering for specific cravings after seeing the film, you’ll know which picks have your favourite Spider-star as the focus! The primary hero of Into the Spider-Verse, Miles has a long comics history—first as the replacement for the deceased Peter Parker in the Ultimate Marvel universe, and then as a hero in his own right in the “prime” Marvel Universe after the events of Secret Wars. These picks cover both those important periods of Miles’ life. 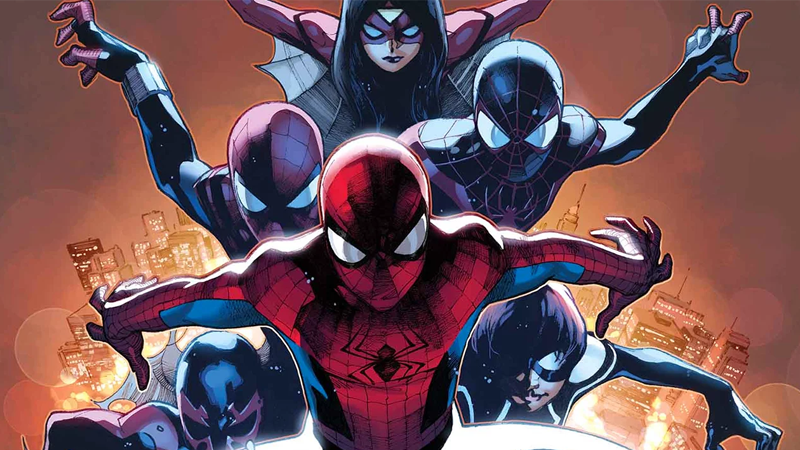 Ultimate Comics: Spider-Man, the relaunch of Ultimate Spider-Man in the wake of Peter Parker’s death in that universe, is where Miles first makes his mark as the next Spider-Man of his Earth. If you want to start anywhere with the character, this is it. 2015's Spider-Man, meanwhile, is a sort of continuation. It’s set after the events of Secret Wars, which saw the Ultimate Marvel universe destroyed (don’t worry, it got better, sort of) and Marvel’s cosmic reality reshuffled into an all-new, all-different universe. It’s got a bit of a different vibe than Miles’ Ultimate book, as it’s set in the “main” universe and Miles now works alongside Peter and all the other primary versions of heroes we know and love. Oh, and in a fortuitous bit of timing, a brand new series for Miles began just this week: Miles Morales: Spider-Man! By Saladin Ahmed and Javier Garron, it’s re-centring on Miles as a young kid having to deal with two wildly juxtaposed lives. Considering there’s only one issue so far, there’s no harm in jumping on board! This version of Gwen wouldn’t exist without the event this movie is based on—and she is arguably the biggest addition to the Spider-canon to come out of Spider-Verse. Which means, of course, there’s plenty to read up on already! Edge of Spider-Verse #2 marked Spider-Gwen’s surprise debut, introducing us to her origins while giving us a stylish take on what to expect from this version of the character. It was immensely well received, to say the least. Hard to think that in just over three years, she’s gone from one-off spinoff to movie star. Spider-Gwen was the series Gwen was given in the wake of her hugely popular debut in Spider-Verse, fleshing out her home dimension of Earth-65 while giving Gwen her own twist on the Spider-villain roster to do battle against. Spider-Gwen: Ghost Spider is a current miniseries tying in to the ongoing Spider-Geddon, a crossover sequel to Spider-Verse. It focuses on Gwen’s exploits during the event, where she’s seemingly cut off from the rest of her multiversal friends. It also is the first series to carry Gwen’s new codename, Ghost Spider... but everyone still calls her Spider-Gwen. Hell, even Into the Spider-Verse does! There are approximately 70 billion Peter Parker comics out there—after all, he is the Amazing Spider-Man! Not the one and only, by any means, but the original. But the Peter of Into the Spider-Verse isn’t the typical Peter you’d see swinging around Spider-Man comics on the shelves right now. He’s older, wiser, he’s been there, thwipped that. So these picks likewise star an older Spidey—and, for good measure, given that he’s Miles’ mentor in the movie, we’ve through in a couple of teamup books featuring the two heroes. Spider-Man: Renew Your Vows is an alternate re-imagining of Spider-Man where his marriage to Mary Jane Watson wasn’t annulled by a literal deal with the devil (it’s, uhh, a long story), and they had a daughter together...and eventually fought together as family of superheroes. 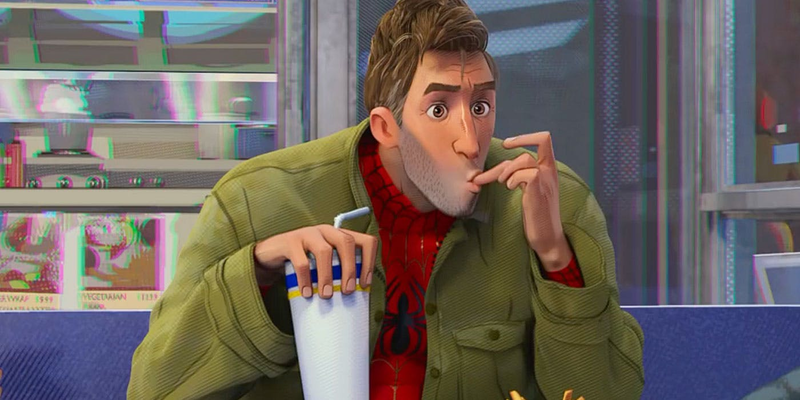 It’s not quite the down-on-his luck older Pete of Into the Spider-Verse, but it’s still an interesting and rare look at an older Parker. Marvel Knights: Spider-Man meanwhile doesn’t explicitly star an “older” Peter—in fact, it’s more of a Peter at his prime. But it’s still a great story that weaves around keeping his identity secret, and all the pressures on his friends and family that gargantuan task entails—and features some great encounters with Spider-Man’s most iconic villains. Spider-Men and Spider-Men II are two different meetings between the Spider-Man of the primary Marvel universe (Earth-616) and Miles Morales (of Earth-1610). The first marks their very first meeting, as Miles tries to comprehend working alongside a man who, in his world, died and gave him the inspiration to become a hero. The second is less dramatically compelling as it takes place when Miles and Peter are not just familiar with each other, but exist in the same universe again. Peter Porker’s come a long way from weird joke to... well, a more prominent weird joke, but he has quite the comics history—and not just as an odd alternate Spider-Man that appeared for an offbeat gag in a teamup. 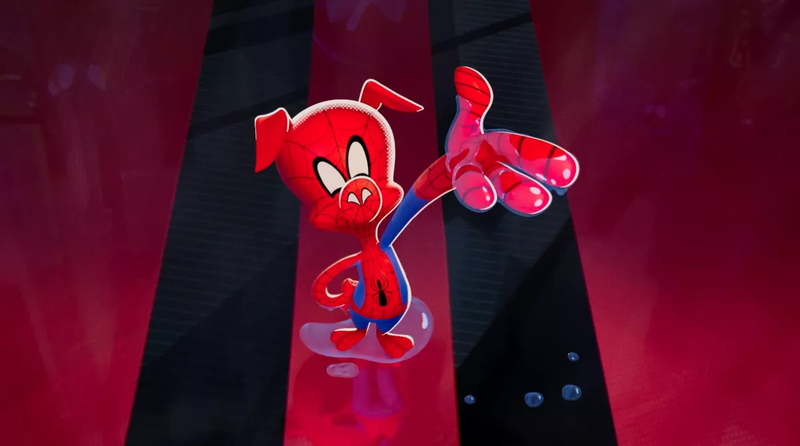 Peter Porker, The Spectacular Spider-Ham is Spider-Ham’s spinoff series from the ‘80s, after he made a special debut as part of the Marvel Tails one-shot in 1983, highlighting cartoony, animalistic takes on Marvel icons. It’s goofy and good fun, but goes to show that Ham isn’t just a one-off joke. His book ran for just seven issues, before Peter became a backup character in the Marvel Tales reprint series. Spider-Ham 25th Anniversary Special, released in 2010, is a delightful anthology of tales celebrating the world of Spider-Ham—from giving him his own “Swinester Six” to face off against, to introducing his heroic daughter, Swiney Girl. Web Warriors is a little more in line of what you can expect of the Ham we see in the movie. A spinoff that launched after Spider-Verse, it sees Spiders of multiple realities alongside Ham operating as guardians of the web of life, the pan-dimensional thread that connects all Spider-heroes together. It’s a team book and Peter Porker isn’t the immediate focus, but if you like him and want something in line with Into the Spider-Verse’s premise, it’s ideal. The dark, dramatic “Noir” Spider-Man is one of the more famous alternate takes on Spider-Man around—even though he’s actually just nine years old. Spider-Man Noir was the miniseries that introduced this Peter, transplanting him in ‘30s New York, facing the perils of the Great Depression and Spidey’s greatest villains, re-imagined as bosses in the city’s criminal underworld. It’s less of a traditional superhero story and more of a dark, noir crime thriller that just happens to star Spider-Man. 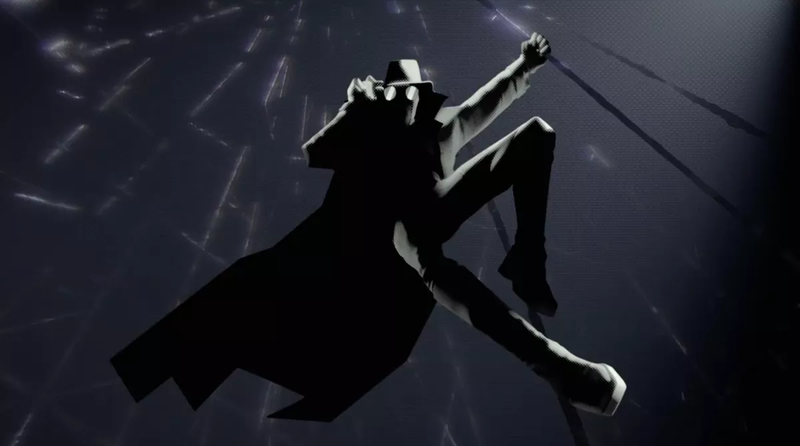 Spider-Man Noir: Eyes Without a Face was a direct continuation of the first Noir miniseries, picking up with Peter shortly after the events of Noir as he goes up against the Crime Master and Doctor Octavius, and crosses paths with the infamous Felicia Hardy. Edge of Spider-Verse #1 is the first issue in a prequel tie in that built up to the 2014 event Spider-Verse, setting up a few of the Spider-heroes that would appear in the event, Noir included. The first issue sees Noir going up against Mysterio in a stylish and dark story, before he’s hauled into the pan-dimensional weirdness of Spider-Verse. The Peni we meet in Into the Spider-Verse is a bit more stylistically different from her comic book origins—and they’re pretty limited, as she is one of the most recent additions to the Spider-Verse. But that still doesn’t mean there aren’t at least some stories for you to check out! Edge of Spider-Verse #5 gives us Peni’s origin tale, which is a little less cute than you might expect from the bubbly, anime-esque youth we meet in Into the Spider-Verse. If anything, it’s a bit more Neon Genesis Evangelion, as Peni takes on the mantle of piloting the SP//dr mecha after her father dies operating the suit, forming a symbiotic link with the suit through a radioactive spider that serves as an organic link between Peni and the machine. Edge of Spider-Geddon #2 is part of a similar tie-in series, this time for Spider-Verse’s spiritual sequel, the currently ongoing Spider-Geddon. Set between Verse and Geddon, Peni’s story here sees her struggle with loss and familial strife as she continues to hone her skills as SP//dr’s pilot. It’d be pretty silly to recommend Into the Spider-Verse-adjacent comics and not mention the series it borrows its name and extended premise from. In 2014, Spider-Verse united Spider-heroes from across all sorts of parallel realities (not just old faces from alt-stories, but new heroes, like Gwen and Peni!) in order to face the Inheritors, a race of multiversal vampire-esque beings who feed on the energies attuned specifically to Spider-powered heroes. It’s got a tonne of incredible Spider-Man fanservice, just like Into the Spider-Verse—and is a true love letter to the legacy of one of the greatest heroes in comics.